goodbye, Joe, me gotta go, me oh my oh! Under the cover of darkness, she sails under the Verrazano-Narrows bridge, heading south. What what was such a behemoth carrying? our upriver correspondent caught her boatload few hours earlier (thank you, Jeff)! Another hefty load here. The ship is Dutch. Hm, jenever-infused crawfish, anyone? herring-gulf oyster po’boy? cajun edam ‘cheesecake’ soufflé? alligator nasi goreng (indonesian fried rice)? mmm! Oops! they turned east. If they did a 180°, they could make it for mardi gras! Don’t know the song? ah, but he’s the king!!! son of a gun, we’ll have big fun down on the bayou! 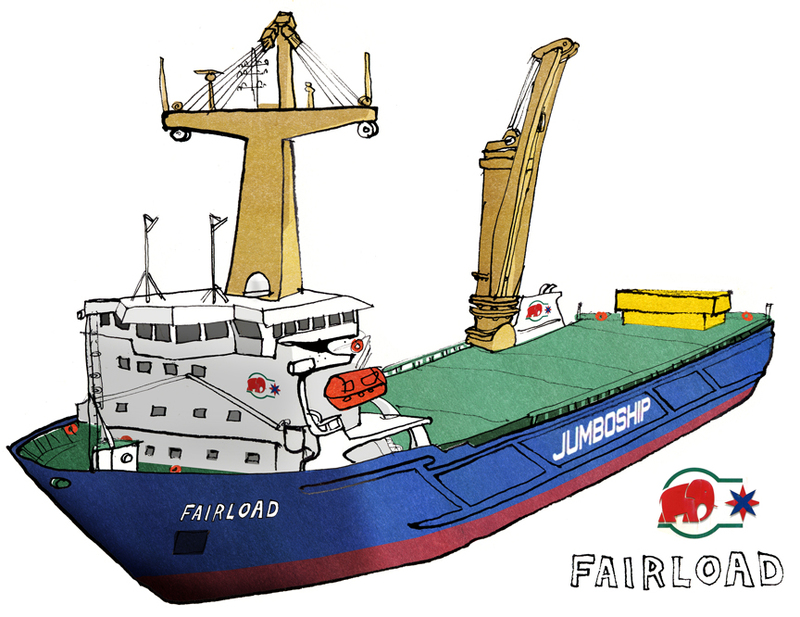 Their web site http://www.jumboshipping.nl/jc_fleet_g500.asp has details on MV FAIRLOAD. It also has a ship simulator you can download if you fill in what looks like a job application form. It looks like she’s headed toward Gibraltar but it’s funny. AIS says she was in NYC for only an hour. What can you do in an hour? Swap crew members? Gorgeous rendition, down to the orange life rings. buck–she was passing thru from up your way. check out jeff’s info in the link. should we try to get a group rate at Ship Stalkers’ Anonymous? I saw… very nice photography! I’m very glad Bowsprite put in those links. As always, you’re the best! brazos bill–nice to see you appear! Nice. I’m charmed. Now I have to go look up more on her. What a great blog, Christina. See you someday down where the streets meet the sea. I’ll be the one looking for ducks, the great flocks of scaup in Dead Horse and Gravesend Bays, but I definitely have an eye out for the ships as well. I would have liked you to change JUMBOSHIP to JUMBOSHRIMP. Oh for the want of an R and an M.
jumboshrimp . . . kinda oxymoronic. i like that. dip it in cold hot sauce to slowly break your fast. There’s the dipping sauce factor, true. 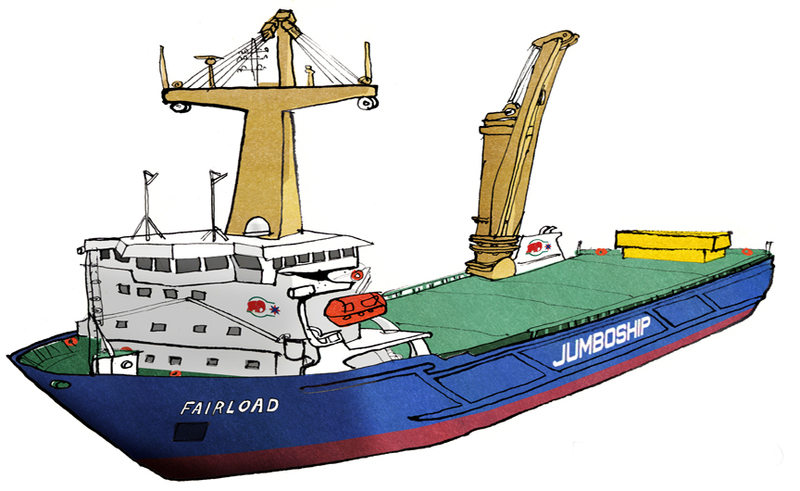 Also “JUMBOSHIP” sounds like it was named by an eight year old. So I see no reason to be mature about it. Now I have a taste for cocktail sauce. But there’s none coming in my immediate future. If she is Dutch I’d love to partake of her Gouda cheese and good beer. The Dutch make also super good chocolate –but you said nasi goreng – I love that – Oh la la you make me hungry now. honestly . . . i prefer bami goreng to nasi.